Just to have a rest and relaxation – it’s fine! BUT – to combine two variants of the rest - it’s even more than fine…We decided to offer You combined tour – horse-water tour – “Road with clouds”. First – start with riding horse. If You never have had opportunity to ride a horse – we start slowly, step-by-step. 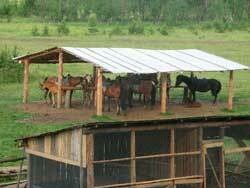 Try to find common language with the horse – feed, stroke, take away on a watering place. To walk with the horse will bother You quickly enough – and that is why You decide to ride and go. Have accustomed to a saddle? We can start! On road of a horse campaign we will bathe in lake Galamit, ascend on mountain Jalangas. You will visit the Crane bog where make the real fir oil. During a season You can take pleasure in mushrooms and berries “hunting”. By the end of horse round, you probably even will start to suffer conscience that have a rest while your colleagues suffer at stuffy offices. Miss water round? So it is a high time to change on a catamaran. Want to stir feet in fast water – welcome. At your service - rafting on the most beautiful river White - or Agidel – it’s another name. It’s a cradle of Bashkiria. 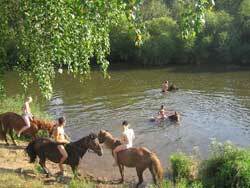 First round of the combined horse-water tour – from the 1st up to 5th day – horse tour on Southern Ural mountains. 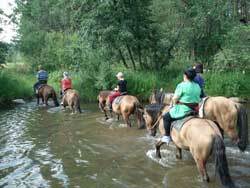 Second round of the combined horse-water tour – from the 6th up to 11-12ve day - rafting on the most beautiful river of Southern Ural Mountains - White with visiting of caves Mindigulovsky, the Fairy tale, Kapova. In case of 12-days tour the second round is 1 day longer – it can be or calm rafting or one day on the bank – depends on Your choice. Meeting in Beloretsk (railway station). Arrival to tourist base. Breakfast, sauna – on Your wish. Acquaintance, instructing, Acquaintance with a harness, training to skills of riding. Trial riding walk. Lunch. Transfer to a stationary camp on the lake of Galamit - 2 km. from base. Dinner. Spending night in tents. Breakfast. Walk to the Crane bog (18 km.). Lunch . Excursion fir-oil workshop where it is possible to get pure fir oil. Dinner. Spending night in tents. Breakfast. Walk to mountain Jalangas (15 km.). Lunch. Excursion to rocks. Photos from height of the bird's flight. Dinner. Day near Jalangas. 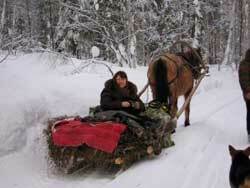 Free time – free-riding, gathering mushrooms and berries. Breakfast. Transfer to the tent camp at the Galamit lake. Swimming in the lake. Lunch. Walk to the base. Sauna. Preparing for rafting. Spending night in tents in the base (or in the houses – on wish**). Arrival to the river. Start rafting. At the route – visit to Mindigul cave and other sights of view. Variant –excursion to Kapova cave *** where drawings of the primitive person have been found. Visiting museum "the Gold bee" *** (history of natural beekeepings). Arrival to the base. Souna. A farewell dinner, a shish kebab. *It’s impossible to present the exact plan of the tour – just the draft. For example – newcomer can learn riding during one day or two days… To ride at the route is possible faster or more slowly… The most important thing – to make the rest comfortable, interesting and safety!! Dining 3 times-a day .Natural non-polluting foodstuff – fish, meat, milk, Sour cream, cottage cheese and marching meal: porridges, soups, canned food. At the route the tourists cook themselves. In the - professional cook. The standard: at the route tourists saddle and unsaddle a horse by themselves, take away and result it from a pasture (around 200м. ), put and remove tents, cook food. The instructor helps to make all it correctly. In a campaign of a horse go with bags. Variants with horse-drawn and auto-support are possible. Price includes: all transfers inside the route 3-times dining equipments and horse rent, service of the instructor, sauna. “Service Comfort” – instructor put and remove tents, make fire, prepare wood, saddle and unsaddle a horse – 250 RUB/person per day. Number of persons in the group: starting from 4 persons. **Possible residing in the houses while staying in the base for additional payment. One place in 2-3 persons-room – 350-500 RUB/person per day Reservation – in advance. *** Not-including in the program, additional payment.